Baron BMW invites you to visit our fantastic luxury car dealership near Kansas City, MO. Our knowledgeable team members are ready to provide you with the best BMW sales, service, parts, and accessories near Kansas City area. If you’re looking for only the best deals on new & used BMW luxury cars and SUVs in the Kansas City area, then stop by today to test drive one of our latest models. We offer a great selection of new and used 5-Series, 3-Series, X5s, and many other popular models. Call (913) 318-3634 today for BMW KC pricing, availability, service, parts, accessories and more! If you are a new or veteran BMW enthusiast in the greater Overland Park, Olathe, and Kansas City, KS area, you’re in the right spot! Baron BMW offers an envious selection of the season’s hottest-selling BMW models as well as wide selection of reliable pre-owned cars. In understanding that every driver wants to shop for a car differently, Baron BMW invites you to explore our new BMW and pre-owned car inventories online or in person. Whatever you prefer, just know, our expert staff is renowned in and around Merriam, Kansas for their ability to listen to drivers’ needs, and help them find just the right car and/or services to suit their lifestyle. This year, BMW have infused a whole lot of, well, newness into their new model lineups. This might sound obvious, but as you know, some automakers release new cars without doing too much to improve them. For BMW, however, improvement is a continuous pursuit and they’re always trying to push the limits. Visit Baron BMW today and see for yourself how they’ve raised the bar on safety, comfort, and aesthetics in models such as the X3, X5, 330i, 340i, and 530i. Want even more BMW excitement? We are proud to introduce the BMW i3 – an innovative electric vehicle new to the BMW model lineup. Looking to spend less on a car? We offer a wide selection of quality pre-owned BMW cars that drivers in the Merriam, Overland Park, Olathe, and Kansas City can enjoy. So take that extra green and use it for a down payment, vacation, whatever suits your fancy. You’ll still enjoy like-new quality and performance. Pre-Owned is really just in the name. If you’re looking for only the best deals on new & pre-owned BMW Luxury Cars & SUVs in the Merriam KS area, then stop by today to test drive one of our latest models. We offer a great selection of new and pre-owned 5-Series, 3-Series, X5s, and many other popular models. Call 913-318-3634 today for BMW KC pricing, availability, service, parts, accessories and more! Regardless of whether you choose to buy new or pre-owned at our BMW dealership and service center serving Overland Park, Olathe, and Kansas City, you can rest assured knowing you’ll drive away with a car loan or bmw lease that suits not only your current financial situation but your future fiscal goals. You’re also our neighbor. And, we promise to always treat you as part of the equation. New models, pre-owned cars, and auto financing are only part of the equation here at Baron BMW. To ensure optimal long-term vehicle operations, we also offer a stellar assortment of genuine BMW parts to drivers from Overland Park, Olathe, and Kansas City. Not to mention premium car service and auto repair for those drivers who don’t feel like doing it themselves. 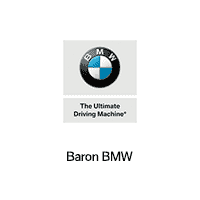 Eager to get to know more about Baron BMW- and all of the wanted products and services we offer? Don’t be a stranger. Stop by 9010 Shawnee Mission Pkwy, Merriam, KS 66202 when you can. We’re just a short drive from Overland Park, Olathe, and Kansas City. Or, if it is easier give us a call at 913-318-3634. And, we’d love to have the opportunity to meet you too.